Berg & Berg is a Scandinavian online store, which sells men’s clothing and accessories. It was founded in 2009 by Mathias and Karin Berg. Berg & Berg boxer shorts are made in Italy by a family company that has been in the underwear business for more than 30 years. 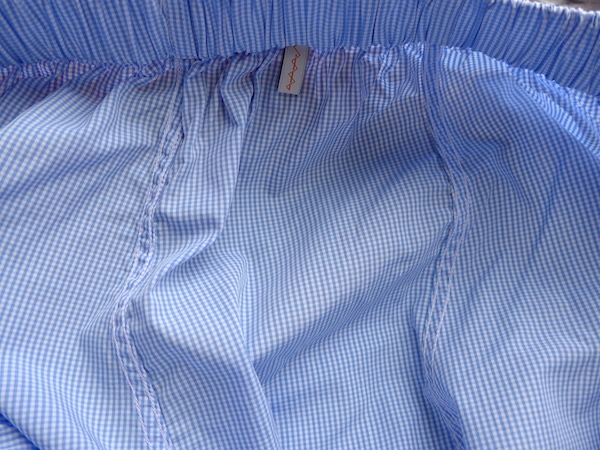 These boxers feature comfortable channel waistbands, twin-needle side seams (about 6 stitches / 1 cm. ), 3-piece back panels and plastic buttons which are machine-sewn with no shanks. They’re not the most luxurious boxer shorts in the world, but I think they are a good value for money. Berg & Berg boxers are made of 100% cotton fabrics and available in sizes 46, 48, 50, 52 and 54 (in other words, S, M, L, XL and XXL). There are solid colour boxers as well as striped and checked ones (colours: white, light blue, mid blue, navy, burgundy). Of course, Berg & Berg boxers are machine washable. You can purchase them at BegrBergStore.com, they cost about 30 USD per pair (excluding VAT). Berg & Berg often put them on summer and winter sales with 30-50% discounts. … and plastic buttons (no shank, sewn by machines).